For years, the crime novels of Kate Atkinson have sort of drifted around me. A copy of One Good Turn was prominently displayed at my library for some time, and I used to pick it up and look at it almost every time I went to the library. A copy of When Will There Be Good News? once appeared on my office’s book discard shelf, and I also picked it up and looked at it several times. Around the time I finally decided to take it home with me, someone else had already claimed it. So I’ve been curious about Atkinson for a long time but never quite curious enough to take the plunge and seek out one of her books. 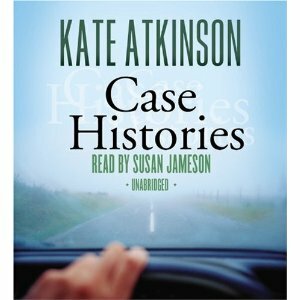 Jenny’s review of Case Histories last year took me past curiosity and caused me to put Atkinson on my list of must-read authors. And this year, Catherine‘s loan of the marvelous Behind the Scenes at the Museum revealed to me that Atkinson is an author I simply must follow. Case Histories is the first of Atkinson’s three mystery novels about former police inspector turned private investigator Jackson Brodie. The novel opens with the recounting of three cold cases: the disappearance of a little girl from her backyard, the murder of a young woman in her father’s office, and a young wife’s going after her husband with an axe. The only thing they appear to have in common is Jackson, who is hired to look into some aspect of each case. I mentioned in my review of Behind the Scenes that the actual story Atkinson tells is not all that unusual, but that the writing makes it shine. The same is the case here. The mysteries, taken on their own, really aren’t all that exciting; and the solutions are either obvious, uninteresting, or overly reliant on coincidence and authorial trickery. As a mystery, I’m not sure I can call Case Histories a success. However, as a novel, I loved it. Atkinson’s writing covers over a multitude of sins, and I was utterly won over. I listen to audiobooks when driving, and I found myself wanting to take the long way to get to my destinations so I could keep listening! The audiobook reader, Susan Jameson, obviously understands the humor in the books, as demonstrated in her perfectly wry style of telling the story. I was roaring with laughter in some of the early sequences as Atkinson’s wickedly dark humor is on full display. Her sense of humor is absolutely right up my alley, and she gets extra points for tossing in an amusing Thomas Hardy reference. Besides the humor, the other thing I really liked about the novel is the characters. Atkinson writes about the lost souls who populate the novel with compassion and honesty. She shows them engaging in sometimes absurd behavior without seeming to laugh at them, and she depicts some of their horrible wrongs without condemnation. I especially grew to love Theo, the grieving father hoping to find the uncover the identity of the man who knifed his daughter. But I was also impressed with her characterization of Amelia and Julia, the sisters of Olivia, the little girl who disappeared when the novel began. At a few points their story did border on the ridiculous, and I fretted that they would both just end up on opposite extremes of unfortunate single-woman stereotypes, but in the end, I think Atkinson pulled off the tricky task of making them odd and sad but not quite pathetic. So now with two Atkinson novels under my belt, I intend to continue feasting on her wonderful writing. I already have the audio version of One Good Turn ready to go. This book does have a different narrator (Steven Crossley), so I wonder how that will affect my impression of Atkinson’s own voice. Her distinctive writing style is such that I can imagine having the wrong reader will kill the effect. We shall see how it goes! Other reviews: Harriet Devine’s Blog, Books I Done Read, Citizen Reader, Of Books and Bicycles, Book Chatter. This entry was posted in Audiobooks, Contemporary, Fiction, Mysteries/Crime. Bookmark the permalink. I enjoyed ‘One Good Turn’ even more and ‘When Will There Be Good News’ is every bit as good. There is a fourth one, ‘Started Early, Took My Dog’ due out in August, which I can’t wait for. Yet another book to be added to the summer reading list! It looks like the new book won’t be out here until next spring, which only means I’ll have time to get all caught up before it’s easily available. Hooray! I kind of feel this way about Elizabeth Peters – her mysteries aren’t super-mystifying, but she makes me laugh, so I’m willing to forgive her. A good sense of humor can cover for such a multitude of sins with me (not that Elizabeth Peters has a multitude of sins!). Jenny, Kate Atkinson doesn’t have a multitude of sins either, just a few minor ones in the mystery construction. But I absolutely do not care; her writing is so good. I can’t remember if I’ve read any Peters. I think she might have been one of the many that I sampled back in the mid-90s when I was voraciously reading crime novels, but there were so many I tried then and only a couple stuck. The “Jackson Brodie” books (some of my favorite reading this year) remind me in of the mysteries of Susan Hill (although the writing styles are very different) in that the “small” mysteries of who dunnit are almost throwaways, whereas the “big” mysteries of life (who are we, how do we relate to others, and how do we keep putting one foot in front of the other when devastating things happen to us) are really what make Atkinson’s books what they are. That and, to me, the laugh out loud humor. It’s hard to believe in books where terrible things happen to people that there could be so much laughter, but I found myself alternately biting my knuckles and chuckling as characters moved through the extremes of human existence. Thanks for the review. I’ve just added it to my audible.com wish list! I hope you enjoy it as much as I did, JoAnn! Eva, I’m just over an hour into One Good Turn, and I’m liking it on audio. The narrator doesn’t have quite the same wickedly witty tone as Jameson, but his voice is working fine for me. I’m glad you enjoyed this Teresa, I love the Brodie books and can’t wait for number four! I think it’s marvellous how Atkinson blends great humour and sadness and creates such memorable characters. Sarah, Atkinson really is a marvel at creating a wonderful tone. I can’t believe I hadn’t read her before! Yeah, who dun it really isn’t all that interesting a question here. It was the people who interested me.